Happy New Year! I hope you are as enthused to start the year as me. This has been a long time coming, but I think now is a good time to share my vision of how we are going to take Social Media Club from informal groups of individuals working together for the common good to the streamlined professional organization we are already starting to evolve into. As I lead SMC into 2014 I will do everything I can to keep intact the same values and mission we were founded upon. I want to begin by thanking some of the people who have really supported me throughout this transition. To my amazing Board of Directors and the global social media community management team, thank you for your steadfast support and making the unbelievable possible. None of us would be here without Chris Heuer’s and Kristie Wells’ incredible vision and genuine love for SMC and everything we stand for and I am eternally grateful to them. I also must thank my family and friends who always believed in me and I owe everything to their faith. Since joining the SMC Global Board of Directors two years ago, I now bleed yellow and green. I will use my professional background to connect media makers, promote media literacy, industry standards, and ethical behavior on a new level. I think if I explain a little bit about my path, you will be able to better understand my aspirations. I almost died in a traumatic car accident many years ago. I was in a coma for 6 days, unconscious for a month, and confined to the hospital and a wheelchair for 7 months. I was partially paralyzed and had to relearn how to breathe, eat, talk, and walk again. I was a young man when this happened, but I firmly believe as unfortunate as it was, I would not be half the man I am today if this had not happened. The trauma taught me patience. I feel that is among the greatest virtues known to man. It gave me an unfathomable drive to succeed and gave me unparalleled organizational skills. After I learned how to perform basic functions again, I kept pushing and I am now in the best shape of my life! I frequently speak to audiences filled with hundreds of people. The experience challenged me to learn. I have 3 degrees, including my MBA and I am privileged to learn new things from all of you every day. One of the most valuable things to me now is my career. I have directed social media, marketing, public relations, web technologies, and market research for over 15 major corporations and I live for mentoring others on the trade secrets I acquired. I was born and raised in the outback of Alaska and have lived in 7 different states and 4 different countries. Now I live in one of the top social media and tech cities in the world and love feeling the energy of like minded entrepreneurs every day in San Francisco, California! I am truly driven and want SMC to be the professional name people have grown to trust for social media insights — no questions asked! I want us to be known around the world for offering distinguished memberships in an organization whose reputation for education and social media prowess is unparalleled. We must continue to advance learning, technology, writing and mentorship across all aspects of social media marketing. I want us to provide a safe haven for learning, because our youth is our future. 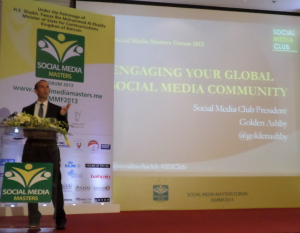 Not to be outdone, I want to implement global acceptance of social media marketing techniques by strengthening the collaboration between regional SMC chapters and members so we can holistically grow. I hope this has given you better insights as to who I am and how my journey has given me the ability and eagerness to lead the SMC to great new heights. Underneath my savvy business exterior I am a very down to earth and fun guy. That’s why I can live and breathe social media so much, because it is very fun. Please connect with me, follow or friend me; and help me share your wisdom and ideas with the global community.